Maserati’s 96-year history included numerous convertibles. Classics like the Mistral, Ghibli and Spyder hit the roads across the world. But all these models had one thing in common, they were all two-seater roadsters. 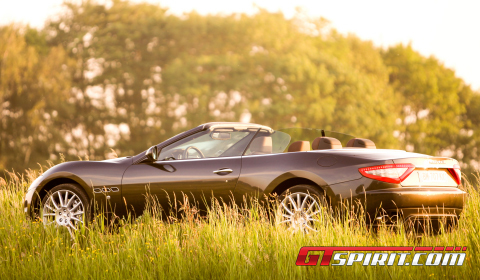 The 2011 Maserati GranCabrio is the company’s first four-seater soft-top and we took the roofless sports car for a drive searching for the ultimate mix between an excellent appearance, GT performance, a wonderful sound track and four single seats. Aimed directly at the American market Maserati is gambling its prestigious brand offering extra seating capacity hoping that it will prove to be a marketing winner with respect to the competition. Maserati is currently up against models from Mercedes-Benz, BMW and Jaguar. All these brands offer exclusive four-seater convertibles for people who love open-top driving. 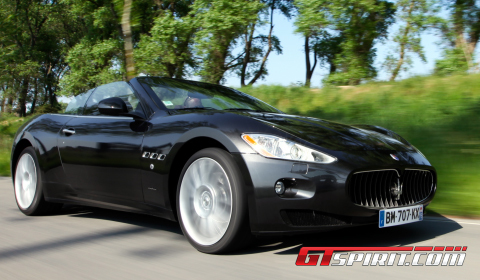 The GranCabrio is the third model in the Maserati lineup between the GranTurismo and the Quattroporte. The Italians offer a package, which is quite similar to the GranTurismo model series. The GranCabrio is powered by the 4.7 liter engine from the GranTurismo S. Delivering 440bhp at 7,000rpm and 490Nm at 4,750rpm, the melodious 4.7 liter V8 takes you in only 5.4 sec to 100km/h. The top speed is 283km/h and 274km/h in case you open the roof. This is slighter slower than the lighter coupe. The V8 engine is linked to a six-speed ZF transmission from the base model GT. A Sport button is available for improving the aggressiveness of the transmission shift points, exhaust sound, throttle touch and the stiffness of the variable suspension. These figures are quite impressive if you look at the weight of 1,980kg. The convertible has a number of enhancements to maintain the coupe’s solid structure, including cast aluminum reinforcement in the windshield pillars. Much of its structure has been substantially reinforced to compensate for its decapitation. Only 100kg has been added, which is quite an achievement. Adding the insulated fabric top and operating mechanism did not change the weight distribution. A slight rear weight bias (49 percent front, 51 rear) is available for sporty handling. The top and all side windows raise or lower with a press of a button in 28 seconds, at speeds of up to 30km/h. The roof is stored behind a leather-covered lid. Rollover-protecting bars behind the rear headrests deploy in 190 milliseconds if necessary. The anti-theft system, including a reach-in alarm, works when the top is down. A wind deflector can be installed to reduce wind buffeting. Maserati claims the ride offers a combination between easy steering, responsive handling and a smooth ride, which in the end proved to be quite accurate. The GranCabrio has a fine ride and a perfectly weighted setup, but lacks any type of sportiveness. Despite its stunning looks, the GranCabrio always feels like a heavy car and is not hugely different from the GranTurismo to drive. The steering isn’t razor sharp and a bit artificial. The handling is sufficient, but never challenging. The Maserati insulates its passengers from any rude shocks, although the extra flex in the open-top body does translate to a jittery ride at lower speeds. The interior is truly unique with respect to its competitors, but not any different from the coupe. The leather-wrapped dashboard and interior panels have a tailored look. The multimedia system holds an audio and satellite navigation system. The controls are relatively easy, but some buttons feel cheap, are ergonomic mishaps and too flimsy for such an expensive car. The cabin does offer enough space for four persons, but lacks space to store things. 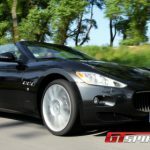 With the top down, the Maserati does a good job of sheltering front-seat occupants from the elements, although turbulence is a lot higher in the back seats. With a pathetic 173 liter of capacity, the trunk is way too small for a car with these kinds of exterior dimensions. It provides barely enough room to fit multiple overnight bags. The Maserati GranCabrio is a true combination between style and luxury offered in a four-seater package capable of transporting you anywhere with a great amount of ease. The true emotion comes from the back and is one of the highlights surrounding the roofless vehicle. Of course, it also has spacious rear seats, the romance of an Italian badge and an immense brand cachet you will hardly miss out on. The biggest omissions are the absence of a decent cargo compartment, the artificial steering and the lack of any challenging sportiveness. Still, it handles surprisingly well for such a big and heavy convertible, but is more focused on transporting its four passengers safely than providing a constant thrill to the person on the driver’s seat. In the end you will be left with that wonderful V8 soundtrack and the excellence of an open-top ride, remembering that a Maserati is bought with your heart not your head, and with its supermodel good-looks and epic soundtrack the GranCabrio is a winner.